Below are examples of some of the screens you will see when using SPLServer. This does not include every step necessary to create and/or edit an SPL. You should request a full demonstration to see all of the capabilities of this software service. After selecting LOT DISTRIBUTION DATA from the drop-down of SPL types available on the Create SPL screen, the following screen will appear. Here is where you enter the Effective Date and Report Start Date (the Effective Date serves as the Report End Date). 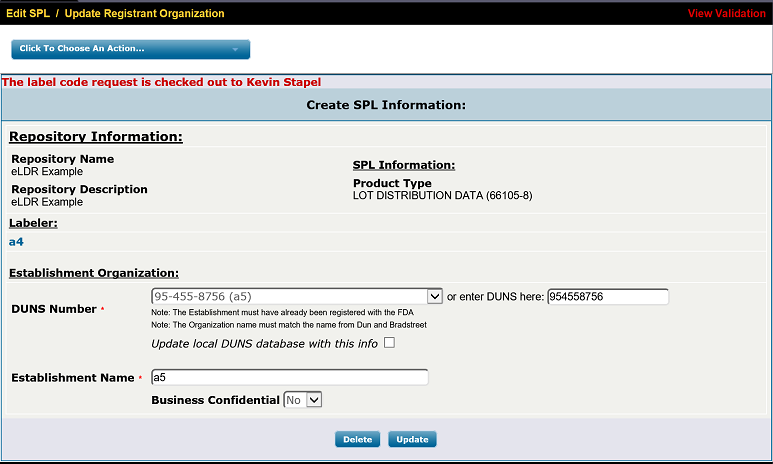 You then select your Labeler Organization from the DUNS Number drop-down list or enter new information including your Manufacturer's License Number. You then select "Update Labeler and Add Bulk Lot Manufacturer". Note that you will be able to add as many Bulk Manufacturers as you like by going back to the Labeler Organization screen and repeating this step. 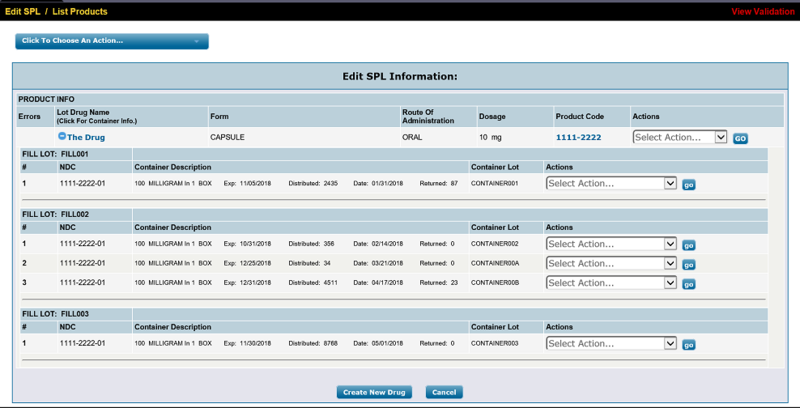 The following screen is an example of the "Add Bulk Lot Manufacturer" function. Simply select a DUNS number from the list or add a new one. 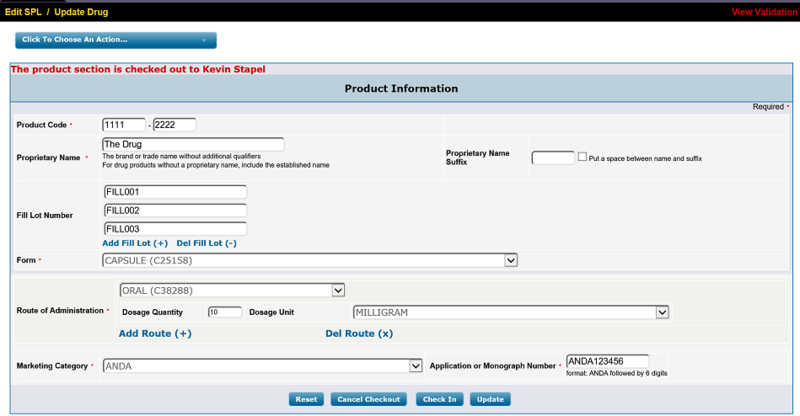 The next screen is an example of the "Add Product Information" function. Here is where you add the product information associated with your report. Note the "Load Product Information" button. If you entered a valid NDC product code available on the NLM, you can pre-load all of your product and ingredient information automatically. This is also where you enter Fill Lots associated with the manufacture of this product. This screen is an example of the "Add Ingredient Information" function. This is where you either enter new information or update information you imported during the previous step. This is also where you add Bulk Lots and associate them with Fill Lots and Bulk Manufacturers that you had previously entered. The following is an example of what it will now look like when you return to the Update Product Information screen. Expanding the product will now show the Fill Lot information with container information. You enter the container information by selecting "Add Container Lot" from the drop-down list associated with the product. When adding Container Lots, you must append your package code to the NDC number, enter your Container Lot and expiration date as well as how many items are in your package. You then enter your distribution information by adding the number of containers distributed and the number returned, if any. This screen is a portion of the SPL eLDR report as it is generated from the data entered.